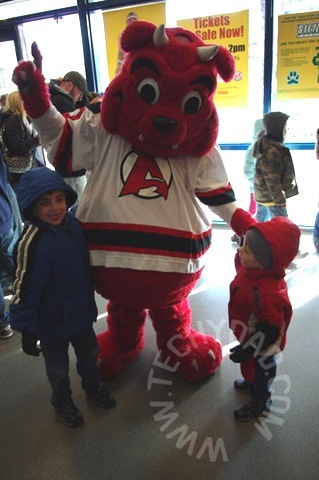 Last night, we took the boys to a hockey game. 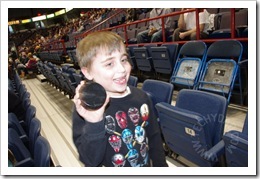 This wasn’t their first hockey game, but it did contain a lot of firsts and favorite moments. 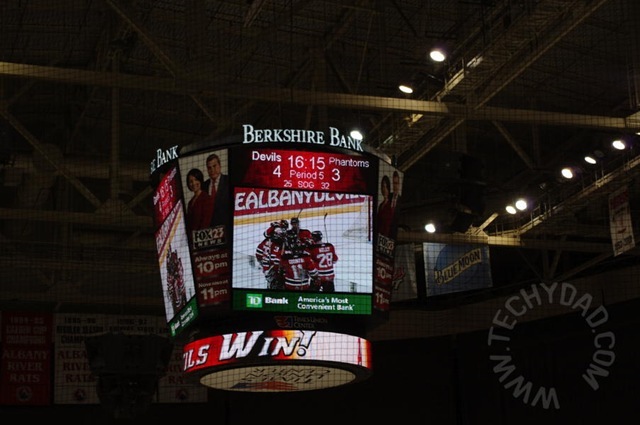 Of course, the main “first” was that this wasn’t an Albany River Rats game. The team name changed when the New Jersey Devils returned. 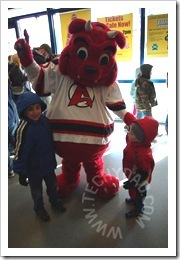 Our team is now the Albany Devils. This also means we have a new Mascot. Instead of Rowdy the Rat, we now have the Devil Dawg. I must admit that I thought this character looked a bit freaky when photos were first released. Luckily, it looks less scary in person. The boys headed right to him as B went to buy tickets and then loved spotting him where ever he appeared during the game. As we watched the players practice, one of the players flipped a puck over the glass. I didn’t spot it at first, but NHL did. He and another boy shot off after the puck. NHL had luck on his side and the puck bounced so that NHL was able to grab it first. 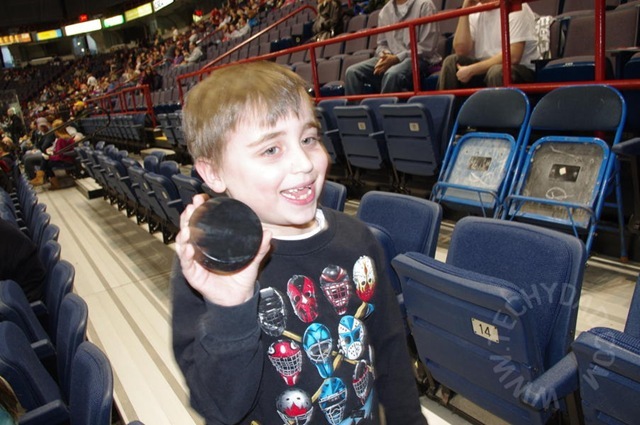 His first hockey puck! 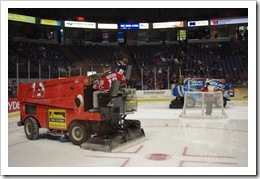 After that came an old favorite of JSL’s: The zamboni. He loves seeing them go around and smooth out the ice. 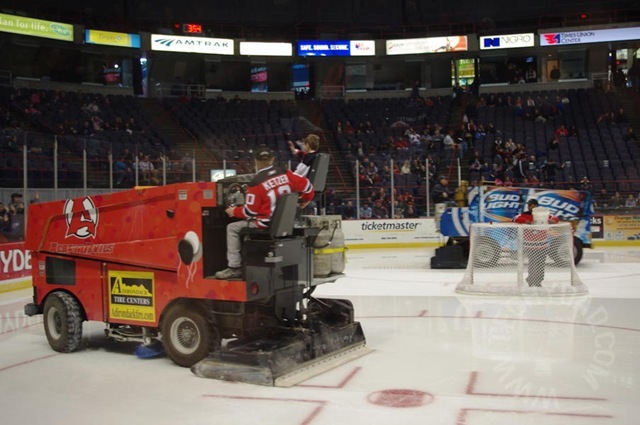 I’m convinced that he would drag us to an “ice show” that consisted of nothing but zambonis driving around for 30 minutes. The hockey game commenced and NHL was into the game, yet distracted. 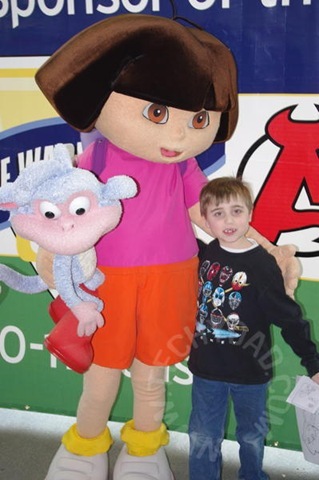 He had heard that Dora would be at the game and he was determined to see her. 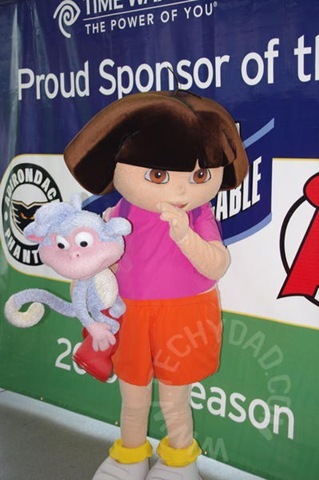 We ended the first period down 0-1 and I figured out where Dora would be. Off we went. Of course, the line was outrageously long. I let the boys wait on line and told them that we might not get to see her. After all, there are only 20 minutes between periods and the line was huge. Slowly, the line shortened and we inched closer. The boys got excited as they caught glimpses of the famous Spanish-speaking explorer. Finally, we were there. 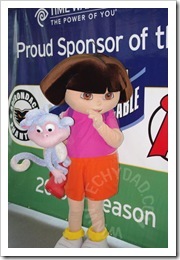 The boys received a Dora autograph and coloring page. 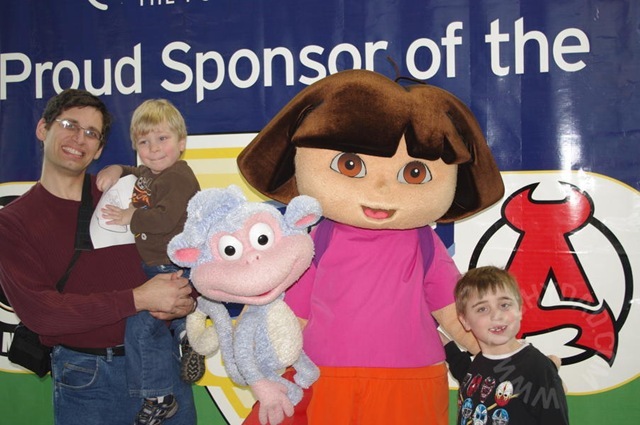 Then, they got to see Dora. Well, NHL did. JSL refused to go near her. 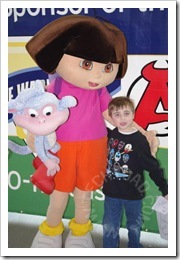 I wasn’t about to let that much waiting time result in no JSL photo with Dora though. 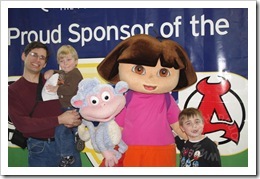 I handed the camera to B, scooped up JSL, and walked up to Dora. Back to the hockey game we went. This was turning into a real nail-biter. We went from being down by 1 to being up by 2 to being tied. The tie game turned into overtime. The overtime turned into a shootout. This was a first for both my boys and for me. I’ve seen hockey games won and lost during regular play and overtime, but have never seen a shootout first hand. We all cheered as our player rushed the opposing goal and jeered when the opponents rushed ours. 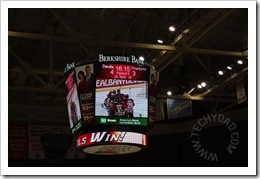 One of the Albany Devils got a goal in and everyone cheered. The rest of the players (both ours and theirs) were being blocked. NHL could hardly stay in his seat. He was so excited. The last opposing player was up and we were on the edge of our seat. He approached the goal and… DENIED! The arena (minus a few opposing team fans who had journeyed to support their team) exploded into cheering. NHL and JSL were right there with them. We got back home, stopping to pick up McDonald’s along the way as a special treat, and the boys were still loving their day out. There was so much that they loved about the night and so much excitement. They agreed with us that this was something we had to do again.